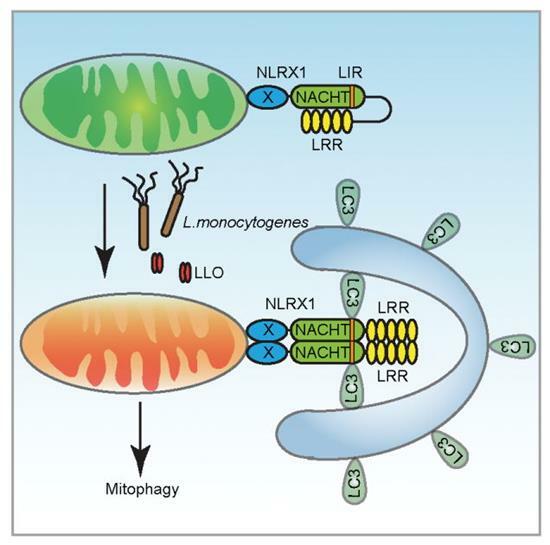 Chinese researchers found that Listeria monocytogenes promoted its own survival by inducing mitochondrial autophagy (mitophagy) in macrophages and identified a new mitophagy receptor NLRX1. Mitophagy is a kind of selective autophagy process, which regulates the metabolic state and cell fates by specifically degrading damaged or redundant mitochondria in cells. However, which substances can induce mitophagy under physiological or pathological conditions and which molecules specifically mediate the activation of mitophagy pathways are still the key scientific questions to be answered in this research field. Youcun Qian 's group has carried out exploration research work on nod-like receptors (NLRs) for many years. Previous studies have shown that NLRC5, a member of the NLR family, promotes resistance to infection of Listeria monocytogenes (Yao, et al., Cell Res 2012) by regulating the expression of major histocompatibility complex protein MHC class I genes, while NLRP3, another NLR member, can be activated by perforin expressed in cytotoxic T cells and promotes anti-tumor immunity (Yao, et al., Nat Commun 2017). However, the function of NLRX1, the only member of the NLR family located in mitochondria, remains unclear. To investigate whether bacterial infection activates mitophagy pathways, the researchers used intracellular bacteria (Listeria monocytogenes and Salmonella) and extracellular bacteria (E. coli andCitrobacter rodentium) respectively to infect macrophages and systematically analyzed the occurrence of mitophagy. The results showed that intracellular bacterial infections could significantly induce mitophagy in macrophages. Further studies showed that listeria infection induced calcium influx, mitochondrial damage and mitophagy by secreting hemolysin O (listeriolysin O, LLO). By means of bioinformatics prediction and RNA interference, the researchers found that the NACHT (nucleotide binding and oligomerization domain) domain of NLRX1 contained a conserved autophagy marker LC3 binding motif (LC3-interacting region, LIR) which was required for listeria and LLO-induced mitophagy. At the physiological functional level, by use of NLRX1 gene systemic knockout and macrophage-specific knockout mice, as well as the mitophagy inhibitor Mdivi-1, the researchers showed that inhibition of mitophagy led to the accumulation of mitochondrial reactive oxygen species (ROS) in macrophages and the inhibition of listeria survival. At the mechanism level, they demonstrated that the LRR (leucine-rich repeat) domain of NLRX1 associated with its NACHT domain to maintain a monomeric and resting state, while listeria infection or LLO stimulation led to oligomerization of NLRX1, which facilitated the binding of the LIR motif of NLRX1 to LC3 for mitophagy induction. In summary, this study for the first time demonstrates the critical role of a NLR family member in regulation of mitochondrial homeostasis by identification of NLRX1 as a new mitophagy receptor, and the mechanism exploited by intracellular pathogens to hijack host cell mitophagy, providing new molecular targets and therapeutic strategies for anti-infection therapy. The international academic journal Nature Immunology published online the latest research results of Youcun Qian 's group, Shanghai Institute of Nutrition and Health, Chinese Academy of Sciences on Feb. 25, 2019. Dr. Yifan Zhang, an assistant researcher at the Shanghai Institute of Nutrition and Health, Chinese Academy of Sciences, and Dr. Yikun Yao, a postdoctoral fellow, are co-first authors of the paper, and Dr. Youcun Qian is the corresponding author. The study was assisted and supported by Professor Stephen E. Girardin of the University of Toronto, Professor Houhui Song of Zhejiang Agricultural and Forestry University and Professor Jianrong Wang of Suzhou University. The study was supported by the funding from the National Natural Science Foundation of China, the Ministry of Science and Technology and the Chinese Academy of Sciences, and was also supported and helped by the technology platform and animal facility of the Shanghai Institute of Nutrition and Health. The model for Listeria to hijack host cell mitophagy. NLRX1 localizes in mitochondria. The LRR domain of NLRX1 associates with its NACHT domain to maintain a monomeric and steady state in macrophage. Upon Listeria infection, its virulence factor LLO secreted out of Listeria induces mitochondrial damage and NLRX1 oligomerization which exposes the LIR motif of NLRX1 to bind to LC3 for mitophagy induction.